Aging is inevitable, yet growing older often has a negative stigma attached. However, it’s actually a process that should be cherished. We should be focusing on how each decade brings us new life lessons, friendships, and experiences. Judith Viorst, the author of NEARING NINETY, encourages us all to embrace the positive moments that life brings, no matter how many candles your birthday cake has on it this year. Showing up when I say I’m showing up. Sticking with what I’ve started until it’s done. Sending valentines to all the children in our family (until they reach the age of twenty-one). And never, ever leaving the house without eyeliner. Playing a relentless game of Scrabble. Keeping the secrets I promised I would keep. Being able to laugh about the bad things that happen to me (Though not before I first whine, and weep, and rail against my fate, and blame my husband). Doing work I’m able to be proud of. Making a truly transcendent matzoh ball. Coming to terms with mortality (though, to be perfectly honest, I’m still not feeling all that thrilled about dying). 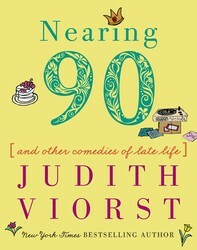 Excerpted from Nearing 90 by Judith Viorst. Copyright © 2019 by author. Used by permission of the publisher. All rights reserved. Judith Viorst was born and brought up in New Jersey, graduated from Rutgers University, moved to Greenwich Village, and has lived in Washington, DC, since 1960. Viorst writes in many different areas: science books; children’s picture books—including the beloved Alexander and the Terrible, Horrible, No Good, Very Bad Day, which was made into a box-office favorite movie of the same name; adult fiction and nonfiction; poetry for children and adults; and musicals.